Philadelphia artist Heather Riley does not seem to limit herself or the genres that interest her by pursuing strict mediums. Her artwork encompasses work on canvas, panel, paper and wood construction. Last Friday evening, 3rd Street Gallery in Old City, Philadelphia opened Interact, Riley’s foray into a full exhibit of her work with a particular emphasis on her found wood constructions and mixed media. The multiple combination of materials Riley employs in her construction piece From Above weaves a narrative that the viewer may spend a long time deciphering. A found wooden cigar box complete with brass hinges and a page of text from Herbert Spencer’s Trial and Compromise: The Principles of Ethics is artfully crafted into an assemblage that also features slivers of wood such as those found in a natural outdoor landscape. These slivers are pierced tightly with delicate thread, placed against the harsh blackened darkness of the box’s graphite-filled interior. Is the delicate white thread symbolic of a greater effort to unify the ideals and paper text of Spencer to the natural outside world and this pictorial of wooden yet dark landscape of earth in which we may live? Possibly the two halves of this cigar box construction reflect the dichotomy that makes up a human’s existence: the intellectual realm of thought versus the reality of the natural world. The artist exhibited several new works on panel that use materials found in craft (such as fiber arts) more often than in strict oil painting. Box Kites is a medium-sized wall piece that manipulates the angular geometry of a flying kite form into parallelograms and triangles of white and green thread. The warm furniture-like brown hues of the oil-painted backdrop seem to mimic clouds with an economy of color that is so masterful – one may think the sky is supposed to be this warm-brown in nature all the time, as opposed to being “light-filled” with sky-blue tonality. Add into this mix the circular dotting of nails holding this threaded composition into place, and one may think he/she is actually looking at an updated Barnett Newman composition or a painterly abstraction reminiscent of the abstract expressionist era. Heather Riley is one of two artists exhibiting this month along with painter Kristine Flannery at 3rd Street Gallery through December 1st, located at 58 N. 2nd Street in downtown Philadelphia, PA. I like the box like structure. (cigar box) I wish I were still in Philadelphia. Hollis, last weekend had at least 5+ stellar openings in the city; it made it almost impossible to choose what to blog! 3rd St. Gallery is one of the most consistently high-end member-run art collectives that Philly has. If you ever fly in from ATL to this area, let me know! Oh I will, definitely. Thank you for your coverage of things happening! I love these works! Even from the pictures they seem to hold alot of presence… plus I love mixed media! Dawn, I am convinced you would have really been drawn to these works, based on my own knowledge of your recent handmade paper pieces, especially. As far-fetched as this sounds, I wish there was a way to display the “dimensionality” of these particular works beyond simply JPEGs, because there is a feeling my words just can’t communicate enough, as you said – a presence – to them. TY so much for stopping in, as I know you’re coming off the opening of your own exhibit this past weekend!! I wish I’d been a ‘fly on the wall’ in Ballarat to see your new lovely work, in-person!! The rapid rate technology is advancing, I wouldn’t be surprised if you were displaying things more “dimensionally” in the very near future! Having said that, I would also like to say you do a fabulous job of bringing to life these wonderful exhibitions. I love seeing the various forms of mixed media and I really loved the earthy look of the “box kites” and loved your commentary re the sky! Anita, thanks so much for popping in and sharing your impressions of this artwork w/ me. 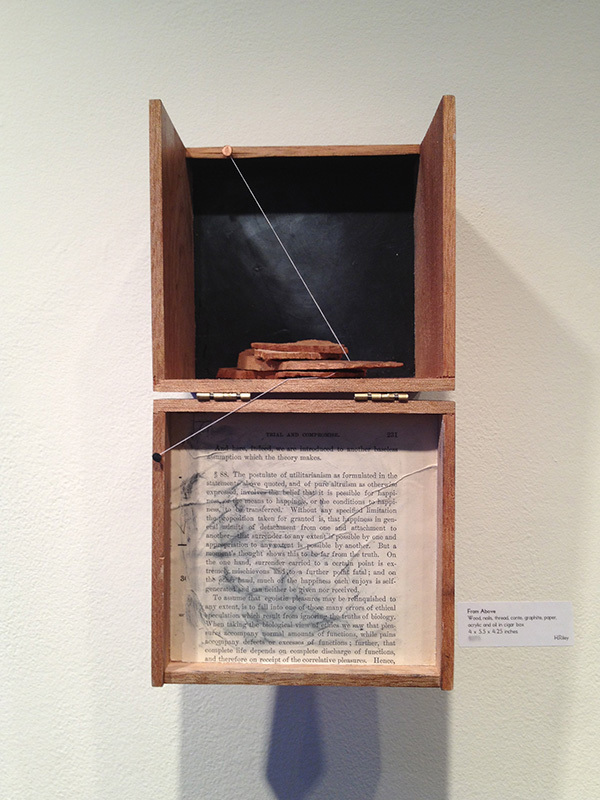 I do also really love the “Box Kites” piece. It makes me so happy to hear that you still feel “in-tune” w/ what is going on in Philly, art-wise, through my blog. Your newest five monochrome paintings of Lake Michigan (Chicago) are pretty incredible; I always enjoy your visits both here and “seeing” your new paintings on your blog, also! As usual, after reading your review, I wanted to see more, so I went to Heather’s website – and wasn’t disappointed. 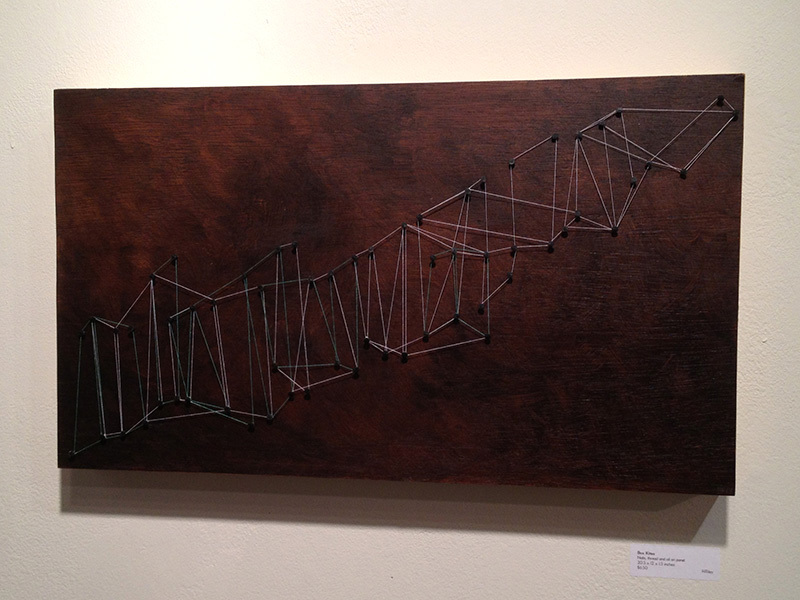 Her exploration of space and her constructed wood pieces really piqued my interest. What an unexpected and effective mix of media! Patricia, I agree with gentlestitches, your analysis of “Box Kites”, and especially of the sky, really brings the work to life! Thank you so much for another great post. Dominique, I’m quite certain the artist would be pleased to hear that not only has her work from this show reached all the way across via the Internet to Vancouver BC, but also reading the wonderful summation of it that you just shared w/ me! Heather does employ an unexpected use of media, and that was exactly what drew me into the gallery to visit w/ the work and write about my reaction to it. As always, thank you so much for stopping by and sharing such profound insights w/ me, Dominique!